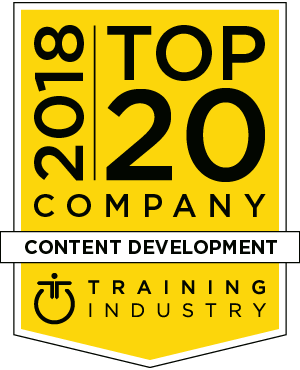 This list recognizes the 2018 Top 20 Content Development companies in the training industry and is designed to help buy-side organizations in their search for the right training partner. NIIT is a market-leading learning outsourcing company that provides a comprehensive suite of managed training services. Our flagship service is curriculum design and content development. Our learning solutions include instructor-led training, e-learning, performance support, social collaboration and resources for ongoing development. SweetRush’s melding of instructional and creative design has earned it the #1 ranking on eLearningIndustry.com, 13 Brandon Hall Golds, and Top 20 for Content Development and Gamification from Training Industry. Its deliverables are relevant, engaging, connect with learners and are highly effective in achieving the business objectives of its clients. CGS Enterprise Learning is a trusted partner to many of the world’s most dynamic companies, delivering innovative, custom learning solutions that are essential to scaling people, processes and performance in today’s ever-changing corporate environment. Our work ranges from interactive game-based e-learning to transformational technology rollouts. Kineo has been shaping the future of learning for more than 13 years. Our 250-person strong content team is located across six continents. They are passionate about learning and design and have deep knowledge of learning technologies to create the most engaging and effective solution for you. Conduent believes the basis for best-in-class learning is content designed around the learner and their daily workflow. We work hand-in-hand with our clients – developing a customized, technology-enabled learning solution that delivers true impact for their specific business goals. GP Strategies has a stellar reputation because of our unique capabilities as partners and problem solvers who create effective solutions that are performance-focused. GP Strategies is an excellent content development partner, but we also extend beyond just that and provide end-to-end training support. CLD continues to be a leader after 39 years by delivering the best training content to the life sciences. TIS (MPS Interactive Systems) is a global provider of learning solutions with over 27 years of experience. TIS has built an enviable track record of designing solutions for a wide array of global clients, ranging from leading educational institutions to Fortune 500 corporations. TIS has won over 100 awards including 46 Brandon Hall Awards. DuPont delivers 1400+ safety, maintenance and human resources SCORM-compliant courses that include interactive exercises to improve learning retention. Our 500+ mobile-friendly courses have a simplified navigation and full-screen streaming video, providing an engaging learning experience. Each microlearning course includes a quiz. For over 25 years, Infopro Learning has been unlocking the human capital for organizations with custom learning and training solutions. They provide a full suite of services in the learning and training field: content development, leadership and learning management, to name a few. We continue to evolve through ongoing content creation in professional development (webinars, workshops and digital resources) and through partnerships. We are always innovating through internal and external events and networks to improve our solutions and further learning for our clients. Caveo’s mission is to deliver custom learning content that aligns to business objectives, elevating the training function to be a valued core component of the enterprise. Since 1979, BCI has developed custom courseware for over 50 percent of the Fortune 500. This training uses a blend of award-winning sales training, acclaimed sales methodologies and patented technologies that produce learners who typically outperform 98 percent of their competitors trained in traditional classroom environments. With over 30 years’ experience, LEO has a wealth of proven expertise in content development. We focus on a partnership approach and involve our client’s experts throughout, building strong relationships that last. Uniquely, our partner companies under LTG provide a breadth and depth of skills that the businesses we work with cannot access alone. AllenComm is a leader in innovative custom training solutions that consistently elevate employee and business performance. With some of the largest L&D, creative and technology teams in the country, we create award-winning learning solutions that precisely meet the needs of our clients and are uniquely tailored and performance-focused. As a leading custom learning provider for nearly 60 years, General Dynamics IT offers clients unrivaled experience across industries, content, audiences and learning modalities. Clients cite our instructional design expertise, innovation and dedication to their satisfaction as reasons they return to us for their most pressing learning challenges. As an industry leader, Aptara provides innovative and transformational learning and performance solutions to the world’s largest corporations. A winner of 25 Brandon Hall awards, four CLO Learning in Practice awards and 22 Training Industry awards, Aptara continues to transform the market. Cegos is a global leader in professional learning with over 200 of the best e-learning courses on soft skills and other business topics. All courses are mobile-friendly and feature extensive interactivity to ensure successful learning experiences. Offered in a range of languages, Cegos’ e-learning supports global training initiatives. CrossKnowledge provides unique and award-winning learning approaches that we have acquired by accompanying clients of all sizes and backgrounds all over the world. Being a content development pioneer is part of our DNA. By working with us, clients will benefit from a complete and customizable integrated learning solution to develop their workforce. RPS has been developing content for our global customers for over 25 years. Our customers span many industries and offer us the opportunity to develop at various scales and level of complexity. RPS' team of learning experts have remained abreast of, and ahead of, the industry when it comes to adoption and innovation of development expertise. As part of our commitment to continuously monitor the training marketplace for the best providers and services we announce the 2018 Content Development Companies Watch List. This list recognizes companies from all over the globe that provide content development services. The 2018 Content Development Companies Watch List is intended to help buyers of training services evaluate learning portal providers. With 20 years of experience in custom training content, Roundtable’s in-house team of graphic and instructional designers, script writers, voiceover talent, video and multimedia specialists partner with our clients to expand their team and deliver completely custom, engaging e-learning courses that resonate with their learners. Mind Tools’ resources are carefully crafted by an in-house content team and come in a variety of formats, from articles, workbooks and bite-sized learning modules to quizzes, videos, infographics, podcasts and online forums. Its 2,000+ on-demand online tools are updated daily and focus on leadership, management and personal excellence skills. G-Cube has been at the forefront of research on use of non-conventional technologies to improve learning reach and effectiveness. We have developed innovative learning solutions to help deliver effective learning for varied clients. Actio Learning creates strategic learning solutions, including custom development maps, courses and innovative learning experiences. Our data-driven solutions balance the goals of the business leader, L&D leader and learner, align learning outcomes with business goals, create world-class performing employees and organizational momentum. Using a combination of learning design and technology, LearningMate partners with organizations across a variety of industries to provide digital learning solutions that create memorable and measurable learning experiences while demonstrating impact on key business factors, strengthening decision-making and driving overall business performance. Over the years, we have built contemporary and impactful learning and training programs for individuals and organizations that bring meaningful results. SwissVBS is a full-service digital learning company with expertise in content development, mobile learning and reinforcement, microlearning, content strategy and learning campaigns. We leverage our suite of offerings to create industry-leading, multi-platform learning solutions that drive meaningful change in behavior and performance. Syneos Health is the world’s only fully integrated biopharmaceutical solutions organization. It was purpose-built with a business strategy that leverages vast inter-company resources to accelerate biopharmaceutical performance. We are dedicated to the biopharmaceutical industry. KPA offers online training courses in environmental health and safety, human resources management, and sales and finance compliance. Our goal is to help clients achieve regulatory compliance, control risk, protect their assets and effectively manage their employees. Cinecraft is a leading producer of custom content learning solutions. We specialize in bringing the learner as close to the skill or behavior to be learned as possible. Cognizant’s Digital Learning Group is a part of Cognizant’s Interactive Digital Business (CDB), one of the largest digital solution companies. Digital Learning Group has over 1500+ learning solution experts and consultants who work towards creating custom learning solutions with scale and creativity for over 300 clients. We provide a dedicated team of professionals, each with their own unique strengths, who are experts in their field. The foundation of our success with our clients is “trust,” and when they are faced with major business goals, our team takes their needs personally. We are satisfied with nothing short of an “enthusiastic approval” from all stakeholders. CoreAxis provides a unique combination of business performance consulting, coupled with custom training development and delivery. Our strength is our commitment to client success and maintaining an innovative mindset as we constantly examine the latest techniques and technologies in support of performance improvement and content development. Since 1970, Pryor has helped 11+ million people and 300,000+ businesses attain career goals by offering comprehensive, affordable and convenient business and leadership training. 10,000+ training opportunities are offered live and online, along with learning assessments, curriculum planning, gamification and microlearning content, and more. For 25 years, we have helped our clients thrive in business by developing custom learning solutions. We believe the most effective learning experience incorporates your company’s brand, culture and values. Our team is tenacious in helping our clients and their people reach their goals and perform at the highest level. The Training Associates (TTA) is a leader in L&D and training-related services. TTA’s strength lies in its vast contingent workforce, which allows us to match qualified talent to our client’s individual needs no matter their size, scope, or industry. Our market-specific knowledge allows us to offer our clients cutting-edge, customized solutions.